New! ASH is APA-based, full-length-enriched, single-stranded cDNA subtraction hybridization library. for a limited time. Please inquire for more details. Also offering a reverse subtraction library for an additional fee. Please contact us to inquire. Insert sizes of about 1200bp (based on colony PCR_ with 10% of clones <500bp, and a >95% recombinant rate. Number of clones: >30,000 for a subtracted cDNA library. Additional clone available upon request for an extra fee. Directional cloning: Subtracted cDNA will be ligated directionally in pBluescript-directional cloning vector modified by Bio S&T.The direction will be 5’-end/EcoRI and 3’-end/XhoI. Libraries will not be arrayed nor amplified. Bio S&T will provide transformed cells. Figure 1: ASH cDNA - Actin gene reduction in grapefruit. Tested and driver cDNA was prepared from grapefruit citrus leaves. 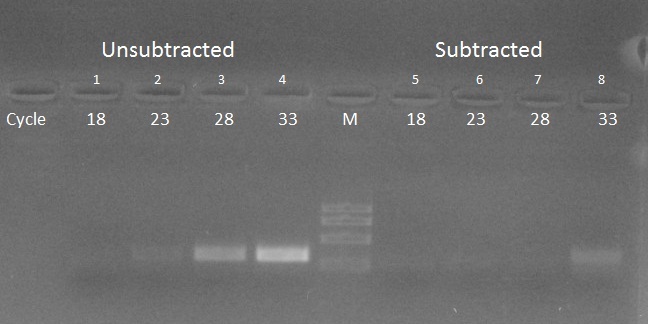 PCR was performed on the unsubtracted cDNA (lanes 1-4) and subtracted cDNA (lanes 5-8) using the actin gene. Note the important reduction of the abundant actin gene. Extraction and purification of total RNA. Anti-sense strand synthesis of tester (Full-length enriched). Sense strand synthesis of driver by APATM (full-length enriched) and labeling. Hybridization at a ratio of >500 :1 (driver: tester). PCR amplification of remaining single-stranded tester cDNA. Purification and enzyme digestion, ligation and precipitation. Transformation and determination of clone size and recombinant rate by PCR. Please note that clone array is not included. Transformed cells will be shipped on dry ice. We recommend that cells be arrayed within 3 days following receipt. Library must be stored at -80 degrees. ASH cDNA subtraction does not use a normalization (self-eliminating) step. SSH method has a normalization step which causes self-elimination of differentially-expressed genes. This causes a representation bias. ASH cDNA subtraction is effective for longer cDNA (usually >1.2Kb). cDNA is full-length-enriched and independent of PCR suppression. SSH method requires truncated cDNA (usually <700bp) and is dependent on PCR suppression. This reduces the subtraction effect. SSH method is not effective for longer cDNA. ASH cDNA subtraction provides non-exponential amplification before subtraction because double-stranded cDNA is not required. SSH typically requires a PCR amplification step prior to hybridization. This causes a representation bias prior to the subtraction step thereby reducing the subtraction effect. ASH cDNA cloning is directional and allows for construction of expression libraries. SSH cloning is non-directional. Directional functional screening is not possible.